Speed Book Dating – Book Week Fun! There’s nothing better than sharing a love of reading and when that sharing happens right in the middle of our senior school library, excitement and passion tends to get a bit contagious! 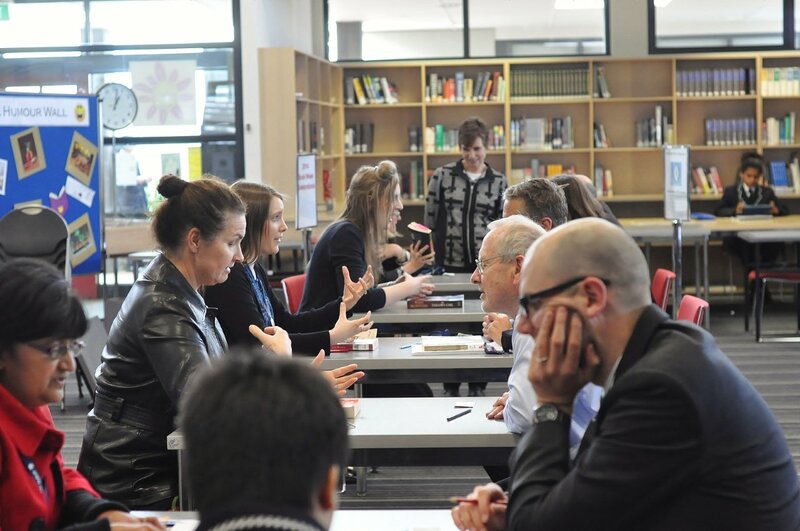 Ten teachers battled it out during our 2014 Book Week Celebrations in our first ever Speed Book Dating event. Teachers had to convince – in just one minute – why other teachers should borrow their book. Once the teachers discovered how short a minute really is, it was awesome to witness the passionate presentation of some very convincing reasons!! Congratulations to Mr Stockdale for his win in convincing a majority of competitors that they must read his chosen book: Tuesdays with Morrie by Mitch Albom. Thanks to all teachers who participated in this lunchtime event. This entry was posted on Wednesday, August 13th, 2014 at 12:46 pm	and tagged with Speed Book Dating and posted in Book Week, Events. You can follow any responses to this entry through the RSS 2.0 feed. « Trivia Competition – Book Week Fun!